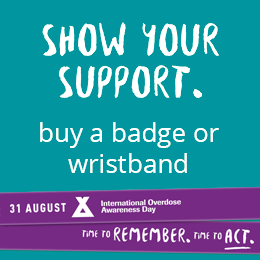 The silver badge and the purple wristband are symbols of awareness of overdose and its effects. Wearing these can signify the loss of someone cherished; or demonstrate support to those undergoing grief. It sends out a message that every person’s life is valuable and that stigmatising people who use drugs needs to stop. Hosting your own International Overdose Awareness Day event or activity, or attending one, is a powerful way to stand together to remember people who have lost their lives to overdose. We provide campaign materials to share within your community to help prevent overdose. Donate and help to raise awareness of overdose and spread the message that the tragedy of overdose is preventable. These videos include people affected by the impact of drugs use and overdose who share some of their stories. My dear sweet Daniel , you were taken from us way too soon!! You will always be in our hearts until we are with you again!! You will always be in our hearts ❤️ MH ?? I love you and miss you more and more each day Hunter Frommelt. You will never be forgotten. June 16th this year my partner of almost 12 years and father of our two boys overdosed and passed away. He believed if we could all do one good deed a day for another human even if it's as simple as a smile or holding a door the world be a better place and someday know peace. I love you Daniel Charles Vance. Life is far from the same without you! I post this tribute to Garrett H. who passed away this week from this disease. I Know he struggled, as I have had to kick this thing, but know in my heart he is with God as he gave his heart to God. I pray at this time for Julie H, and her family who are suffering and seeking to find comfort in this time. God I pray for all those tonite who are wrestling with this demon. God we honor Garrett's life, and know you turn all things to good, Victor B, recovered heroin addict Buffalo NY. Mikhaila Throop could've lived had the , but wasnt used enough on 5/7/2012. The detective told me "she's just another addict " ,,a stigma that stops many from providing help to our young children getting caught up in this younger generation disease killing hundreds each year. Did they go after her 18 yr old friend who provided the opana, xanex, crack cocaine, and other benzos n opiates found in her system,,,no. The provider/seller went off to provide more friends in the next years, helping to kill another school age teen from overdose. O became "aware" of this disease, contacting all I could, post all the time about awareness and Narcan. I got trained "underground" because at the time the FDA would rather approve more drugs for big Pharma to keep making $$$ to help kill our kids, vs life saving Narcan or drug assistance programs for our lower income, less fortunate children. Misha has never left my mind, I'm a different person now, my kids will never be the same without her in our lives snd until my last breath is taken,,I'll scream MIKHAILA's name all day, every year making it known that this is an epidemic, one that needs to be learned n trained to stop n help anyone that struggles with drug addiction. You CANT escape our new reality folks, you WILL know someone who will die because our society sadly is blind n we need to teach them otherwise. My son, Travis, passed away last August from heroin laced with fentanal. Tomorrow I will meet with prosecuting attorney in Cleveland. They want our input on a plea deal for drug dealer. I feel fortunate that my sons case is even being prosecuted. So for all the families that are not seeing any justice for their loved ones, I vow to fight as hard as I can to keep this drug dealer behind bars as long as I can ! With more than 14 felonies including 4 gun charges, it is truly what he deserves. My tribute to all who have suffered this pain and grief. We lost our middle son, Sean on March 28, 2011. He was found alone in a Motel Room. The autopsy said toxic effects of meth, but we believe that he actually overdosed on a drug called 1.4 BDO. The BDO didn't show up on a tox screening, but the last person that was with him told us that was the drug he had with him at the time. His older brother had overdosed but thankfully pulled through just a month before and told us that it was called BDO. This drug is similar to GHB. Sean was an actor and had been an extra in one of Tyler Perry's television sitcoms. He had a heart of gold. Before he died he had wanted to form an organization called Families Against Drugs to help families dealing with addiction. He died before it became a reality and with God's help, we picked up on his vision and formed the organization in his memory. Sean left behind a son and a daughter whom he loved with all his heart. I believe that what plagues me the most is that people don't want to open their eyes to this growing epidemic unless it happens to someone that they love. I suppose that was how I was too though, not realizing the heartache that goes along with OD deaths. I wish more people would get involved and bring awareness to their communities. We miss our son every single second of every single day and some days are still so overwhelming. Sean left a huge hole in our family. I lost my firstborn, my son Kane to opiate addiction two years and ten days ago. Our family chain is broken and nothing is the same. To my dearest friend Michael Anthony Maffetone 6.3.1982-2.11.2012 who passed away from a heroin overdose you are missed so much by many especially me every single day. Gosh it's been so hard knowing I can't talk to you and hear your voice or your laugh. I miss you more everyday but everyday is a day closer to seeing you. I love you forever! My brother Keith died from a heroin overdose in April of 2015. The heroin was laced with Fentanyl and he was alone when he used. No one in my family had any idea that he was addicted to heroin. Nothing prepares you for this kind of loss, and no one should have to go through this. I miss him everyday. Robert Karl Schultheis, III (Robby/ Robby Royberto), our angel, forever 32. 12/24/83-10/17/16, always in our hearts ♥️. In loving memory to my son Shawn Witter January 29, 1990 - May 11, 2017. I miss you so much my boy my heart aches. The herion devil took my son away. God bless us all. I lost my husband of 30 yrs from a heroin overdose in March of this year. He fought addiction for years. It has been such a tragedy for the entire family. I miss him dearly and there is nothing that takes away the pain. It is an epidemic in our community. I want to get involved in helping others fight this dark disease of addiction. This will be my way of keeping his memory alive. He was a great man who died well beyond his years. He was only 50. I will always love you my dear. This is for one of the most magical person I have met, S.E.P. Thank you for opening up many eyes and being the awesome dude you were. You may be gone, but definitely never forgotten. My fiance, Reggie Allen, overdosed on February 25th, 2016. His mom and I found him. He was my soulmate and best friend. I know so many people affected from losing loved ones to overdoses. I miss Reggie everyday and will never forget him. Rest easy Billy Jo you r loved and missed so much. 11-24-74 to 4-4-14? Rest easy Steve Reinhardt ? R.i.p to everyone lost from the disease of addiction. My son Ryan Dickson 25 forever lost his battle May 29 2016. I left a message for you last year too. It wasn't even a year since you'd been gone and there I was, in a place I never thought I'd be - missing you. The pain I carry now is no lighter than it was back then, but better concealed. My life has shattered. It is sometimes motionless yet going through the motions. My heart aches for you and what could have been. What should have been. Your struggle was real and hidden. Your pain was there and unseen. Your life hung on a rope, tipping from one end to the other, never knowing which way the wind would blow and what would happen. The days we spent talking to one another before the final goodbye ring in my ears. You always teaching, always sharing. Somehow, maybe God was preparing me. If I'd had known the outcome, I'd surely have run to your rescue! I would have reassured you and asked you to hold on. Had I been there I would have stopped you. I would have begged and pleaded for your life. And yet, as it is written on your tombstone, words you spoke to me and dad. "Sometimes, the Lord's final healing comes with taking you home." I have to believe and stand by, or I'd go mad. The Lord, He was yours. And you were His. And one day I pray, I'll see you again. I love you Bubba. More than words. I love you! Lost my 17 year old son the night after Christmas 2014. Found him cold and stiff laying on his stomach at 3am. He had snorted a.dose of fentanyl. I do not believe he knew what he was snorting. He had just experimented with xanax the week before. This has been a nightmare. His older brother is a conic user of heroin and has overdosed several times. I lost my first-born child, my son Kenneth 23, on 7/6/12 to an accidental methadone overdose. Ken excelled in everything he set his mind to. Graduated high school as salutatorian in 2007, went to USC Business School, traveled to Hong Kong and Greece, joined Delta Chi and pioneered an idea that led to a start-up company. How I wish I could see what else he could've done in this lifetime. I miss you buddy - Til we meet again my son. My son, Travis, died of an overdose on July 28, 2015. He was only 23. He had been sober 3 months at the time of his death. I know that he fought so hard, and he was a beautiful soul trapped in the hell of addiction. I miss him every day and so wish I could tell him how much I love him and that I know he tried. Rest in peace sweet boy! Donny- You were the best friend any of us could have asked for. I'll never forget the way you dedicated your life to making us laugh. Our memories are endless. I love you, til forever. Wearing a badge or wristband can signify the loss of someone cherished and sends out a message that the tragedy of overdose death is preventable. Penington Institute is collecting your information on this subscription page for the primary purpose of staying connected with you and keeping you aware of activities of interest to you about International Overdose Awareness Day. For this purpose Penington Institute may securely provide your contact details to its service providers including MailChimp and WordPress. Remembering those who have died – or been injured – because of overdose is an important part of International Overdose Awareness Day. If you would like to commemorate somebody, please add tributes here. Tributes will be posted on this website as soon as they are approved. Penington Institute is collecting your information on this page for the primary purpose of staying connected with you and keeping you aware of activities of interest to you about International Overdose Awareness Day. For this purpose Penington Institute may securely provide your contact details to its service providers including MailChimp and WordPress.